The definition of couture -- this elegant, full-length A-line gown showcases modern updates and gorgeous detailing on a classic silhouette. Intricate corded lace and soft tulle trails down to a striking sheer lace train with sweet scalloped hem lace. 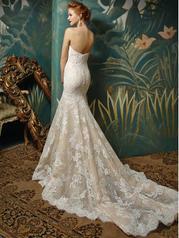 A romantic strapless sweetheart neckline and invisible back zipper closure complete the look.